It has some features indicating localization, such as referring to “western countries” 西國 and “Han lands” 漢地 (i.e., India and China). It is not remarkable for Classical Chinese translations of Buddhist works to insert such notes. Nevertheless, the text is definitely a translation of an Indian work. This śāstra is a lengthy discourse on Buddhist cosmology, presenting it as buddhavācana (the authoritative words of the Buddha ergo true and irrefutable). Chapter 19 is entitled “Movements of the Sun and Moon” 日月行品. It details a flat earth cosmology of Mt. Meru and the four continents, explaining in literal physical terms how these two bodies (which are described as flat drum-shaped deva palaces) orbit above the disc-shaped world at an altitude half that of Mt. Meru, driven by a circuit of wind (vāyu-maṇḍalaka). Solar luminosity is said to be a result of karma of beings. In such a world, the flat earth is stationary while the sun, moon and stars revolve above, not actually dipping below the edge of the world. The apparent arc that the sun follows as it rises and sets as seen from earth is the sun following along its circular path above at an unchanging altitude. This was the standard Buddhist cosmology until modern times, and even today some have reinterpreted it as being what those with “pure vision” perceive as it would otherwise run contrary to the recorded infallible statements of the Buddha in scripture. Some would also suggest that Buddhists did not take Mt. Meru cosmology as representative of the physical world, but this ignores works like this śāstra which explain observable physical processes like the waxing and waning of the moon as being a result of the sun coming close to (the waning) or extending away (the waxing) from the moon along their perpetual clockwise circuits (the sun is on the outer circuit). 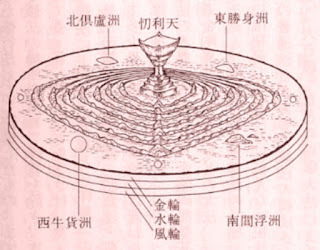 In other words, ancient Buddhists believed the physical world was flat, stationary and that there were four continents surrounding an enormous hourglass-shaped Mt. Meru atop which Indra the king of the gods resides. When he steps out of his palace and looks down he sees the sun, moon and stars revolving around the disc world far below. This is same place that the Asuras once lived until Indra and the devas cast them off the top. They now live at the bottom of Mt. Meru and sometimes climb up "like ants crawling up a tree" to do battle with the devas. This is in line with the mythology of the Indo-Āryans and what the Buddha himself describes in scripture. A spherical earth, even a geocentric model, is at odds with Buddhist scripture. Hellenistic mathematical astronomy was starting to be introduced into India by around the second century CE.2 Although Indian astronomers especially from the fifth century possessed advanced astronomical knowledge, it seems that Buddhists either never became widely aware of it or simply rejected it. Interestingly, in the year 718 in China a text entitled *Navagraha 九執曆 was translated by the resident court astronomer Gautama Siddhārtha, who was from an Indo-Chinese family. 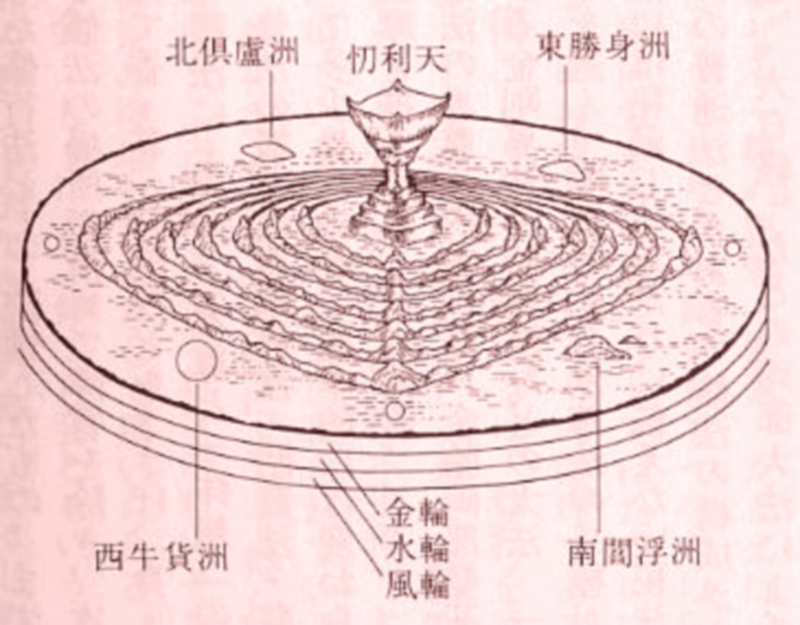 The work provides an accurate mathematical method for calculating one's latitude on a spherical earth (China's latitude is given at 35 degrees, a rough approximation of Chang'an's position). Although such astronomy was superior to what was available in China, the Chinese, like Buddhists in India, either never took much interest in it or simply did not understand it even in translation. However, it was probably the case that such knowledge was kept “in the family” so to speak and as court astronomers they were not permitted to divulge it. The Chinese state had a duty to predict eclipses and compile accurate calendars, and such relevant knowledge was by law supposed to be unavailable to the general public, though it seems the work might not have been widely studied even by Chinese court astronomers. In India such advanced knowledge was likewise probably not widely divulged even in literate society – it was probably something of a “trade secret” which ensured families possessing such knowledge could always find lucrative employment. This belief in a flat earth on the part of Buddhists continued into the eleventh century when the Kālacakra Tantra was written, though Edward Henning has suggested the world presented therein was not meant to be taken literally (see his website here). Returning to the *Lokasthānābhidharma-śāstra, chapter 19 aside from the Mt. Meru cosmology also provides basic numbers for identifying the time of the summer solstice. This interestingly also possibly reveals where the text was originally composed in light of the fact that the length of the summer solstice differs according to latitude. If 1 day is equal to 30 muhūrta-s, then 1440 minutes (24 hours) ÷ 30 = 48 minutes. 1 muhūrta = 48 minutes. Here 1 muhūrta is divided into 30 lava-s, so 48 minutes ÷ 30 = 1.6 minutes. Otherwise, 2,880 seconds (48 minutes) ÷ 30 = 96 seconds. 1 lava = 1.6 minutes or 96 seconds. The text then defines the summer solstice as follows. Srinagar (Kashmir) : 14 hours, 25 minutes (865 minutes). New Delhi (UP) : 13 hours, 58 minutes (838 minutes). Patna (Bihar) : 13 hours, 44 minutes (824 minutes). Chennai (Tamil Nadu) : 12 hours, 53 minutes (773 minutes). Although the numbers given in the next can only be considered approximate, it is noteworthy that a northern location like Srinagar in Kashmir corresponds closer than Patna, which is the old capital of Māgadha. As Radich points out in the Digital Dictionary of Buddhism, the “text is one of a group of cosmological texts related to the Lokasthānaprajñaptipāda of the Prajñapti-śāstra.” The Prajñapti-śāstra is a major Sarvāstivāda Abhidharma treatise. As is well known, the Sarvāstivāda school flourished in northern India. These points, I would tentatively suggest, indicate an original composition in northern India, perhaps around Kashmir, rather than at a farther southern latitude such as around Māgadha. There are other examples in Buddhist literature where the origin of at least one recension of a given text can be inferred from astronomical or geographical data provided. One noteworthy example is the Mātaṅgī-sūtra, otherwise known as the Śārdūlakarṇāvadāna in the Divyāvadāna collection (for Vaidya's Sanskrit edition see here, but exercise caution with it), which is an early Buddhist work significant in its use of mantras, anti-Vedic polemic and encyclopedic detailing of pre-Hellenized Indian astrology (i.e., before horoscopy was introduced to India). It was probably composed in the second or third century. The oldest manuscript of the text is from around the fourth century which was written in North Brāhmī script (see here). Some of the text's contents also generally suggest it was originally composed in Māgadha such as the definition of the māgadha-yojana (the “Māgadha mile”). The aforementioned Chinese translation might be a translation of a modified Central Asian recension which had been revised for the purposes of localization. Other anomalous features of this particular translation include the addition of the metonic cycle (7 intercalary months added in a 19 year) and the originally Greco-Egyptian ordering of the seven planets (Sun, Moon, Mars, Mercury, Jupiter, Venus and Saturn). The latter is especially curious because such an ordering does not appear in Indian literature until around the sixth century CE or perhaps a bit earlier. These features suggest a degree of Hellenistic influence which were added long after the text's original composition. One question that comes to mind about the gnomonic measurements is how they would fit in with the flat earth cosmology of the Buddhists? Gnomonic measurements can be used for calculating latitude, which probably does not work with a flat earth. However, if the point of these gnomonic measurements is to determine the exact time of year from which to calibrate the calendar, then one merely has to know that noon shadows cast on certain days correspond to specific days of the calendar year, which facilitates accurate time keeping. In other words, I do not believe these indicate knowledge of a spherical earth. In addition, a lot of the contents of the Śārdūlakarṇāvadāna seem to have been appended. The lengthy discussions of astrology, measurements and divination on the part of the main character, the caṇḍāla Triśaṅku, have no clear relationship to the early part of the sūtra where Triśaṅku launches into an anti-Vedic polemic against the Brahmin Puṣkarasārin. Such encyclopedic information presumably indicates how much knowledge a caṇḍāla could have, thus proving the fallibility of caste assumptions, though in my estimation it actually functions as a wealth of knowledge which Buddhists at the time could draw from for their own worldly purposes. In other words, the gnomonic measurements, even if they had been initially devised by an astronomer, were not necessarily understood in any scientific sense by Buddhists at the time. Again, one has only to look at the perpetuation of flat earth cosmology in Buddhist history to see how they were unwilling or unable to revise their models which were based on scripture. The vinaya and other early Buddhist literature condemn both astrology and astronomy as worldly and inappropriate. The bhikṣu, as an ideal, is supposed to strive for more transcendental aims such as liberation from saṃsāra. This changes later on in Buddhist history with Mahāyāna and especially Vajrayāna traditions which clearly take a deep interest in astrology and justify worldly learning as expedient. There are, for example, five “sciences” (vidyā) that the bodhisattva should strive to master: grammar and composition (śabda-vidyā), the arts and mathematics (śilpakarma-sthāna-vidyā), medicine (cikitsā-vidyā), logic-epistemology (hetu-vidyā), and philosophy (adhyātma-vidyā). So, were there any eminent bodhisattva astronomers and scientists in the real sense of the word in classical India comparable to Āryabhaṭa (b.476)? Did Nālandā at its height have anyone pushing a round earth theory? These are questions I plan to ponder in the coming years. One problem in this area of research is the amount of highly questionable and wishful Neo-Hindu works on the history of science in India, which inevitably are mixed in with proper academic works. Fortunately, a lot of work done by Indian scholars in the nineteenth century, while dated, is still quite readable and worth consideration. 1 Michael Radich, “Lishiapitan lun 佛說立世阿毘曇論,” Digital Dictionary of Buddhism. Type username 'guest' with no password. 2 David Pingree, "The Recovery of Early Greek Astronomy from India," Journal for the History of Astronomy 7 (1976): 110. See here for online version. 5 Shinjō Shinzō 新城新藏, Tōyō tenmongakushi kenkyū 東洋天文學史研究 (Kyoto: Rinsen shoten, 1989), 217. Reprint of same 1928 work. 6 Zenba Makoto 善波周, “Matōga gyō no tenmonrekisū ni tsuite” 摩登伽經の天文曆數について, in Tōyōgaku ronsō: Konishi, Takahata, Maeda san kyōju shōju kinen 東洋學論叢：小西高畠前田三教授頌壽記念 (Kyoto: Heirakuji shoten, 1952), 201.